Himalaya Herbals Refreshing Cucumber Soap is enriched with Cucumber that refreshes and gently cleanses away excess oil, and Coconut which helps nourish, giving you healthy skin, naturally. The soap base is made from vegetable origin. 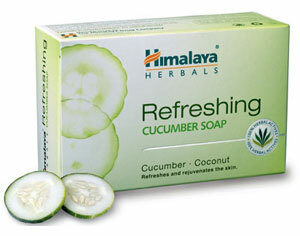 Wet body and face, apply Himalaya Herbals Refreshing Cucumber Soap generously and rinse.